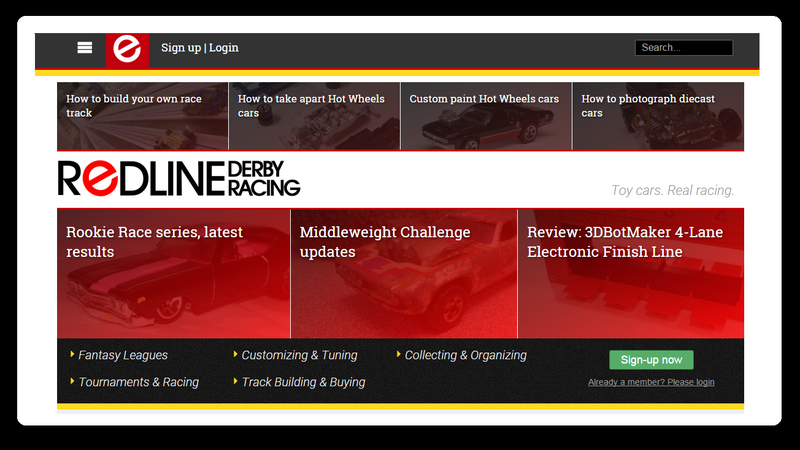 The Diecast 64 Lightweight Downhill Dash is your chance to race your fastest lightweight car. Racers may enter up to 2 cars. There will be a $1 entrance fee per car. If you are a member of the Diecast 64 club the entrance fee will be waived for yourself, friends, and family, for up to 6 cars. Cars due April 22, 2017. Racing will start the following week. This race is part of the 2017 points series. Here are the results for the March Madness Rip'n'Race. Round 1 action from the March Madness Rip'n'Race. As always, cars needed to be able to win 2 consecutive races switching lanes, however only one race is shown on the video. We're down to 16 cars in the March Madness Rip'n'Race. See who moves on. As always, cars needed to be able to win 2 consecutive races switching lanes, however only one race is shown on the video. We're coming down to the wire. Somebody is about to walk away with all the cars. Who will make it to the Final Four? We're down to the final four. Check out the Semi-Finals and the Finals in this video to see who will walk away with all the cars. As always, cars needed to be able to win 2 consecutive races switching lanes. This being the finals, all the races are shown in the video. How far can you jump a Hot Wheels car? Take the Hot Wheels Long Jump Challenge. 2. Take off and land on Hot Wheels orange track, car should "ride out" the landing. 3. One take for jump and measurement, no edits during that portion of the video. We've reached the end of the regular season. This championship bracket is the last chance to score points before we crown a team winner as well as a season champ for the cars. This bracket will feature all eight regular season 1 winners. Results and video of the races will be posted at the end of the week. 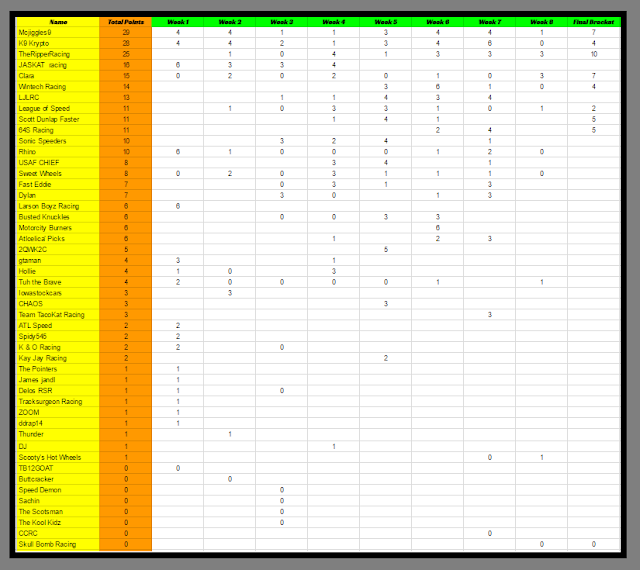 Here is the line-up for races in the championship bracket for season 1 of the Hot Wheels Fantasy Pick'em game. Click on the name to see the picks. Here are the results from Season 1's final week, the championship bracket. Check out the video and see which cars was the fastest car from season 1. Team scores will be updated tomorrow and found below the video on this post. 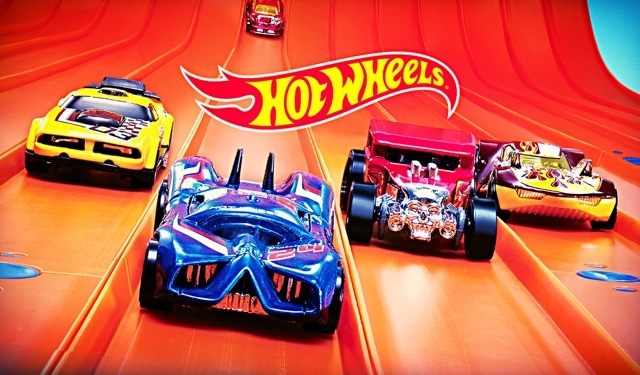 We'll take a few weeks off and be back in April for Season 2 of Hot Wheels Pick'em! Here are the final team stats. It came down to the wire in a close come from behind victory. Mcjiggles9 pulled ahead and pulled off the win in the last week of the season. Congratulations Mcjiggles9 on the win! Thanks to everyone who played Hot Wheels Pick'em this Season. We'll get Season 2 started in a few weeks so check back soon.